I've just returned from a 2-and-a-bit week holiday over Christmas and New Year, although you probably haven't noticed that I've been away because CapnRex101, TheBrickPal and the rest of the team have done an excellent job of running the site and keeping it fresh in my absence. Anyway, at the start of the month, in addition to launching new products, LEGO published new inventories and instructions at its customer services site. 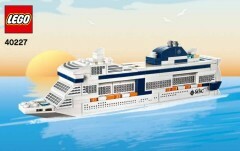 Among the instructions were some for several hitherto unknown sets including 40227 MSC cruise ship which, we can assume, will be available on board MSC vessels as a result of a collaboration between MSC and LEGO that we reported on in 2014. I think it's fair to also assume that it'll be tricky to get hold of unless cruising with MSC. 40166 LEGOLAND Train will hopefully be easier to acquire: it should be available at the parks later this year. Plenty of new ploybags were also revealed, bringing the total of known 2016 polys to 35.